Liberia, the country worst hit by West Africa’s Ebola epidemic, should see thousands of new cases in coming weeks as the virus spreads exponentially, the World Health Organisation (WHO) said yesterday (8 September). The epidemic, the worst since the disease was discovered in 1976, has killed some 2,100 people in Guinea, Sierra Leone, Liberia and Nigeria and has also spread to Senegal. The WHO believes it will take six to nine months to contain and may infect up to 20,000 people. In Liberia, the disease has already killed 1,089 people – more than half of all deaths reported since March in this regional epidemic. Fourteen of Liberia’s 15 counties have reported confirmed cases. 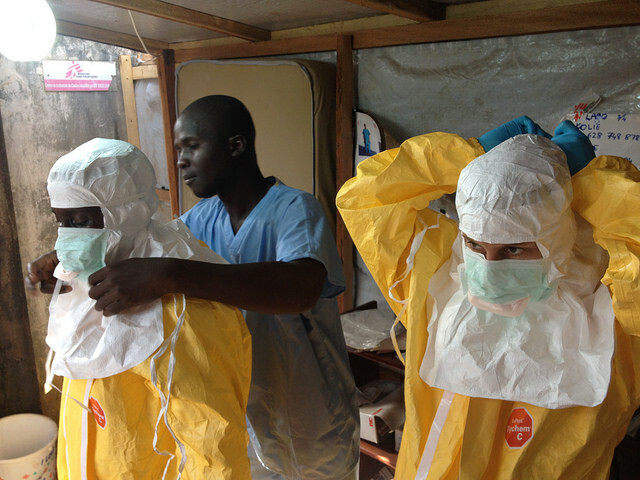 As soon as a new Ebola treatment centre is opened, it immediately overflows with patients. “In Monrovia, taxis filled with entire families, of whom some members are thought to be infected with the Ebola virus, crisscross the city, searching for a treatment bed. There are none,” it said. In Montserrado County, which includes the capital Monrovia and is home to more than one million people, a WHO investigative team estimated that 1,000 beds are urgently needed for Ebola patients, the statement said. Motorbike-taxis and regular taxis have become “a hot source” of Ebola transmission. Liberia’s government announced on Monday it was extending a nationwide nighttime curfew imposed last month to curb the spread of the disease. Sierra Leone last week ordered a four-day countrywide “lockdown” starting 18 September as part of tougher efforts to halt the spread of Ebola. U.N. Secretary-General Ban Ki-moon called British Prime Minster David Cameron, France’s President François Hollande, Cuban President Raul Castro and Herman Van Rompuy, president of the European Council, to urge more support, his spokesman said. While governments and organisations across the world are scrambling cash and supplies to the region, the WHO said its aid partners must scale up efforts by three- to fourfold to battle the epidemic. Conventional control measures were “not having an adequate impact” in Liberia, it said. In a country with just one doctor for nearly 100,000 inhabitants before the outbreak, some 152 health care workers have been infected and 79 have died in Liberia since the crisis began, the WHO said. The United States said on Monday will send a 25-bed field hospital to Liberia to help provide medical care for health workers there. Britain earlier said it would send military and humanitarian experts to set up a treatment centre for Ebola victims in Sierra Leone. Medical charity Médecins Sans Frontières welcomed the move by the British government but voiced fears the disease was moving “catastrophically” through the population. Resources needed to be deployed on the ground more quickly, it said. The WHO said yesterday that one of its doctors working in an Ebola treatment centre in Sierra Leone had tested positive for the disease and would be evacuated from Freetown shortly. It was the second WHO-deployed staff member to contract the virus after a Senegalese epidemiologist was infected last month. Chief executives of 11 firms in the region joined the call for world leaders to step up the fight against the disease, warning yesterday that it threatened the region’s stability. “Without the support of the international community the situation for these economies, many of whom are only beginning to return to stability after decades of civil war, will be even more catastrophic,” they said in a statement. Signatories of the statement included chief executives from ArcelorMittal, Randgold Resources, London Mining, IAMGOLD, Newmont, Aureus Mining, and Hummingbird Resources. Exxon Mobil meanwhile donated $150,000 (€116,000) to the Liberian National Red Cross Society. Meanwhile, an emergency meeting of health ministers and other officials from African Union member states agreed in the Ethiopian capital Addis Ababa yesterday to lift restrictions on travel to and from countries affected by Ebola. A number of African nations introduced travel bans and border closures in recent months despite WHO warnings that the measures risk creating food and supply shortages. “It was agreed that countries should lift travel bans and allow people to move between members states and allow trade but to put proper measures for screening,” Nkosazana Dlamini-Zuma, the African Union’s chairperson, said after the meeting. “We expect them [all member countries of the 54-nation bloc] to implement [the decision] as agreed,” she told journalists. At the rate of spread there won’t be any one left in these in countries. For example, Liberia’s rate of new infections is at around 5% per day. If we were to consider the information from WHO as a constant segment, we’ll see total infection of Liberia’s population by the end of January. Perhaps there may be an issue here that has a lot to do with the position of washing the corpse after a death. If this was still practiced after a death from Ebola ought it not to be avoided. Then another issue might be why not cremate the bodies involved rather than bury them? These are very practical solutions that may assist the position.